Background: Intrathecal transplantation of human umbilical cord mesenchymal stem cells (hUCMSCs) has been shown to be effective for treating spinocerebellar ataxia and can improve patient's neurological function to a certain degree without safety concerns. However, further validation by randomized controlled trials is needed. The present study aims to fill this gap. Methods/Design: A single-center, parallel group, open-label, randomized controlled trial will be performed at General Hospital of Chinese Armed Police Forces, China. 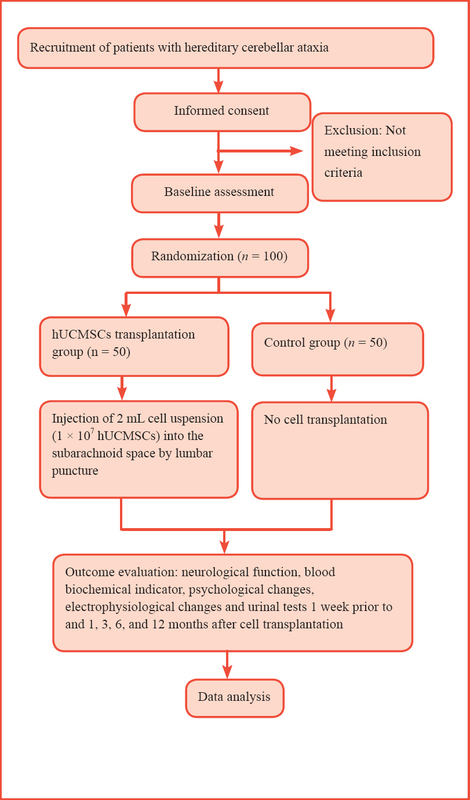 A total of 100 patients with hereditary cerebellar ataxia will undergo hUCMSC transplantation in the subarachnoid space through lumbar puncture (hUCMSCs transplantation group) or not (control group). The outcome observation time will be designated within 1 week before transplantation, as well as 1, 3, 6, and 12 months after transplantation. Primary outcomes include neurological function evaluation (International Cooperative Ataxia Rating Scale, Modified Falls Efficacy Scale, Berg Balance Assessment, Tremor Rating Scale, and the Timed Up and Go test) and blood tests. Secondary outcomes include electrophysiology examination, mental state evaluation, and urine testing. Discussion: This trial protocol is designed to provide reference data for the safety and rational use of hUCMSC transplantation in the treatment of hereditary cerebellar ataxia. Trial registration: ClinicalTrials.gov identifier: NCT01489267; registered on 30 October 2011. The study protocol has been approved by the ethics committee of the General Hospital of Chinese Armed Police Forces, China (approval No. 201117). YHA conceived and designed this trial protocol, wrote the paper and agreed the final version of this paper. Spinocerebellar ataxia is a common hereditary disease of the central nervous system that mainly invades the cerebellum, spinal cord, and brain stem, mostly appears in 30-40-year-old individuals, and is inherited in an autosomal dominant pattern. To date, more than 30 gene subtypes have been identified. The underlying mechanisms behind this disease can be attributed to abnormal expansion of a trinucleotide repeat in the virulence gene, leading to intracellular deposition of mutant protein containing a polyglutamine chain, followed by intranuclear inclusion, and finally neuronal degeneration. Patients present with balance disturbances, dystaxia, dysarthrosis, and intention tremors (Spencer et al., 2003; Walter et al., 2006). This disease is clinically characterized first by the presence of flaccid, powerless lower limbs, with risk of tumbling, followed by poor fine motor activities in the upper limbs, and finally loss of the ability to independently carry out activities of daily life. For this disease, prognosis is poor and effective drugs are not yet available. Mesenchymal stem cells are multipotent mesoderm-derived cells with high self-renewal and multi-directional differentiation capacities. The bone marrow is the main source of mesenchymal stem cells. However, bone marrow puncture is required for harvesting bone marrow and, therefore, this source is limited. Additionally, with aging, the number of bone marrow mesenchymal stem cells decreases, as well as the proliferation and differentiation potentials, and there is an increased risk for viral infection (Troyer et al., 2008). In recent years, human umbilical cord mesenchymal stem cells (hUCMSCs) have become an increasing area of interest in the field of stem cell transplantation for treating central nervous system diseases. hUCMSCs, stem cells from the umbilical cord and perivascular tissue, are considered the ideal seed cells to replace bone marrow mesenchymal stem cells because of their widely available and rich sources, ease of collection, rapid proliferation, stable biological properties, and lack of ethical concerns (Shetty et al., 2010; Fan et al., 2011; Taghizadeh et al., 2011; Dalous et al., 2012). hUCMSCs exhibit high self-renewal and multi-directional differentiation potentials (Liu et al., 2010). Under certain induction conditions, hUCMSCs differentiate into osteoblasts, adipocytes, chondrocytes, myocytes, vascular endothelial cells, neurons, and glial cells and express neurotrophic factor, vascular endothelial growth factor, brain-derived neurotrophic factor, and glial cell line-derived neurotrophic factor (Wang et al., 2004), which can provide neuroprotection. Therefore, hUCMSCs are likely to be ideal cells for cell transplantation. The most recent animal studies have shown that intravenous transplantation of hUCMSCs can reduce apoptosis of Purkinje's cells in the brains of mouse models of cerebellar ataxia and promote locomotor function recovery (Zhang et al., 2011). hUCMSCs exhibit low immunogenicity, do not express graft rejection-related HLAII antigen or effector T cell-induced costimulatory molecules; further, hUCMSC allotransplantation does not produce immunological rejection (Cho et al., 2008; Soleymaninejadian et al., 2012). hUCMSCs have been confirmed to greatly improve neurological function in animal models of cerebral ischemia (Lim et al., 2011; Lin et al., 2011), ataxia, multiple system atrophy (Chang et al., 2011), and Parkinson's disease (Weiss et al., 2006; Glavaski-Joksimovic and Bohn, 2013). Our team performed a series of clinical studies on the efficacy and safety of mesenchymal stem cell transplantation in the treatment of nervous system diseases ([Table 1]) and acquired striking outcomes in the treatment of spinal cord injury, amyotrophic lateral sclerosis, diabetic peripheral neuropathy, and sequelae of traumatic brain injury. However, to the best of our knowledge, few trial protocols and clinical studies have reported on hUCMSC transplantation for treating hereditary cerebellar ataxia. This single-center parallel group, open-label, randomized controlled trial will be performed at General Hospital of Chinese Armed Police Forces, China. The trial protocol was registered at ClinicalTrials.gov (identifier NCT01489267) on 30 October 2011. A total of 100 patients with hereditary cerebellar ataxia eligible for participation in this study will undergo UCMSC transplantation in the subarachnoid space through lumbar puncture (UCMSCs transplantation group, n = 50) or not (control group, n = 50). Outcome evaluation and statistical analysis will be performed by professional staff ([Figure 1]). hUCMSCs: Human umbilical cord mesenchymal stem cells. The study protocol has been approved by the ethics committee of the General Hospital of Chinese Armed Police Forces, China (Approval No. 201117). The benefits and risks of participation in the trial will be explained to each patient, legal deputy, or witness by the sponsors or their designee, and written informed consent will be obtained before the trial. The trial protocol will be performed in accordance with the Declaration of Helsinki, formulated by the World Medical Association. Patients from the Department of Cell Transplantation, General Hospital of Chinese Armed Police Forces, China, who meet all of the following criteria, will be considered for admission to the trial. Patients presenting with one of the following criteria will be excluded from the trial. The included patients will be randomly computerized into a hUCMSCs transplantation group and a control group, with 50 patients per group, by a researcher blinded to the participants. The random sequence numbers assigned for the patients scheduled to undergo therapeutic regimen will be preserved in a sealed, opaque envelop until eligible patients agree to participate in the trial. If any error or disclosure with regard to randomization occurs, a new randomization sequence will be generated starting from the problematic serial number and applied to subsequent patients. The patients and evaluators will be blinded to treatment allocation, and the searcher responsible for cell transplantation will be aware of grouping. If patients exhibit severe adverse events, researchers will determine whether the patient should withdraw from the trial according to the researchers' experience, and related data from these patients should undergo intention-to-treat analysis unless patients ask for removal of these data. The reason for trial withdrawal will be recorded in the case report form and medical case notes. If patients or their relatives do not agree to the following trial during the follow-up interview, the patients will be withdrawn from the trial and the patient data collected before withdrawal will only be included in the final analysis after acquirement of informed consent. hUCMSCs transplantation group: the patients will be asked to lie on their side with their knees flexed and their trunk in a lordotic position. The L 3-4 or L 4-5 intervertebral space will be used as acupuncture points. After topical anesthesia by infiltration with 2% lidocaine, a transfixion pin will be slowly inserted into the subarachnoid cavity. After removal of the needle core, colorless transparent cerebrospinal fluid will flow out. When 2 mL cerebrospinal fluid flows out, 2 mL of prepared cell suspension (1 × 10 7 hUCMSCs) will be slowly infused into the subarachnoid space. After injection, the needle core will be placed back, and the transfixion pin will be pulled out. The patients will be asked to lie in a supine position without pillows. Each patient will receive four hUCMSC transplantations with 3-5 days between two transplantations. Control group: in addition to conventional symptomatic treatment, no interventions or medication will be performed. The allocation arm will be disclosed to all patients and researchers responsible for intervention conduction. Healthy pregnant women, who are scheduled to undergo uterine-incision delivery after 39 weeks of pregnancy and provide written informed consent, will be included in the trial. A 10-cm length of umbilical cord will be harvested during the surgery. Under sterile conditions, after removal of amnion and umbilical cord vessels, the remaining tissue will be washed three times with physiological saline, chopped into 0.58 cm 3 -sized blocks and cultured in DMED medium containing 10% fetal bovine serum. Half of the culture medium will be refreshed every 3 days. The remaining tissue blocks will be removed at 7-10 days of culture. The cells adherent to the flask wall will be digested with 0.25% trypsin and re-incubated. Culture medium will be refreshed every 3 days and passages will be performed every 5-7 days. Passages 4-6 cells will be identified under an inverted phase-contrast microscope and flow cytometer and then used for transplantation. Prior to cell transplantation, passages 4-6 cells will be collected and prepared into 2-mL cell suspensions (containing 1 × 10 7 hUCMSCs). Cells that meet all of the following conditions will be selected for use: (1) under inverted phase-contrast microscope, cells present with typical phenotype of mesenchymal stem cells and grow vigorously; (2) flow cytometry shows a percentage of CD44- and CD29-positive cells > 95% and CD106-positive cells > 80%, HLA-DR expression rate > 5%, and no CD34-, CD45-, and CD14-positive cells are observed; (3) sterility test: negative; (4) presence of endotoxin: negative. Neurological function evaluation: International Cooperative Ataxia Rating Scale, ICARS) (Cano et al., 2005); Modified Falls Efficacy Scale (Hill et al., 1996); Berg Balance Scale (Steffen et al., 2002); Tremor Rating Scale (Duane and Vermilion KJ, 2002); Timed Up & Go Test (Steffen et al., 2002). Blood test: white blood cells, neutrophilic granulocytes, leukomonocytes; glutamic pyruvic transaminase, glutamic oxaloacetic transaminase, lactate dehydrogenase; hydroxybutyrate dehydrogenase; phosphocreatine kinase; uric acid, creatinine, α1-microglobulin, β2-microglobulin, lymphotoxin, tumor markers (AFP, CEA, CA125, CA15-3, CA19-9, CA72-4CY21-1, and NSE), and lymphocyte classification. Psychological evaluation: Questionnaires related to sleep and depression: Beck Depression Inventory (BDI) (Beck and Steer, 1984); alertness: Computerized Continuous Performance Tasks) (Klee and Garfinkel, 1983); memory: Mini Mental State Examination (Tombaugh and McIntyre, 1992). Electrophysiology examination: Somatosensory-evoked potential and brain stem auditory-evoked potential. Urinal test: Proteinum, akaryocyte, α1-microglobulin and β2-microglobulin. The timing of the trial outcome evaluation is shown in [Figure 2]. Figure 2: Timing of the trial outcome evaluation. Any expectant or non-expectant adverse events, such as headaches, dizziness, nausea and vomiting, spasms, fever, or worsened disease conditions should be recorded. If severe adverse events occur, detailed information of the adverse events including the date of occurrence, measures taken related to the treatment, causal relationship with the treatment, and treatment of the adverse event will be announced to the researchers responsible for the trial and clinical ethics committee. Accurate medical records of the patients will be collected by the research associate. Paper case report forms will be inspected and retrieved by the research associate. The case report forms with complete information will be preserved in a secure and locked place for future viewing. All statistical data will be processed by statisticians using SPSS 15.0 software. The numeric data will be expressed as percentages and measurement data as the mean ± SD. A chi-square test will be used to compare numeric data between groups and a Student's t-test will be used to compare measurement data between two groups. A paired t-test will be used to compare measurement data of a participant before and after interventions, and repeated measures one-way analysis of variance will be used to compare numeric data between multiple time points. P < 0.05 will be considered statistically significant. The communication strategy used for this study mainly involves the patients participating in this trial. The patients can decide to participate in this trial after conferring with researchers, relatives, and friends. For more information regarding this trial, patients and researchers can communicate with trial group members by inputting identifier NCT01489267 at www.ClinicalTrials.gov. General information can be found at https://www.clinicaltrials.gov/ct2/about-studies/learn. Spinocerebellar ataxia is a progressive neurodegenerative disease. Theoretically, the survival and function of newly transplanted stem cells is likely to be limited in the brains of spinocerebellar ataxia patients. In some patients, the progression of this disease can be delayed by multiple courses of treatment. However, uncertainties exist regarding optimal treatment times, time interval between treatments, and the optimal number of mesenchymal stem cells that should be intrathecally infused. In recent years, hUCMSCs transplantation studies have reported on the treatment of spinocerebellar ataxia and have investigated the efficacy and safety of this treatment. Some scholars (Qiu et al., 2012; Liu et al., 2014) have treated patients with spinocerebellar ataxia by intrathecal injection of hUCMSCs. International Cooperative Ataxia Rating Scale scores and Activities of Daily Living Scale scores both show that hUCMSC transplantation can improve clinical symptoms of patients with spinocerebellar ataxia to a certain degree. Liu et al. (2010) also treated patients with spinocerebellar ataxia and multiple system atrophy by intrathecal injection of hUCMSCs; International Cooperative Ataxia Rating Scale scores and Activities of Daily Living Scale scores both showed that after intrathecal injection of hUCMSCs, patient's neurological function and activities of daily living greatly improved. Dong et al. (2012) reported that three intrathecal injections and one intravenous injection of hUCMSCs improved early- and middle-state clinical symptoms to a certain degree without safety concerns. Xin and Chen (2014) used ganglioside injection in combination with hUCMSC transplantation to treat spinocerebellar ataxia, showing that patient's clinical symptoms significantly improved, as determined by International Cooperative Ataxia Rating Scale scores and Activities of Daily Living Scale scores. These findings suggest that hUCMSC injections into the subarachnoid space for treating spinocerebellar ataxia are safe and can improve patient's neurological function to a certain degree. hUCMSC transplantation for treating spinocerebellar ataxia is still in the clinical trial stage; and, to the best of our knowledge, related studies have had small sample sizes and lacked a randomized controlled design (Dongmei et al., 2011; Jin et al., 2013; Liu et al., 2014). For this reason, we are attempting to perform the current study to fill these gaps, thereby providing reference data for the use of hUCMSC transplantation to clinically treat spinocerebellar ataxia. Patient recruitment at the time of submission. Prior to submission of this study protocol, the study team led by YHA found that intrathecal injections of UCMSCs improved neurological deficits of patients with incomplete cervical cord injuries; these deficits included sensory, motor, and autonomic nerve malfunctions, as well as urine and stool malfunction, without complications such as infection in the operative site, cerebrospinal fluid leakage, or central nervous system infection. The team also treated 15 patients with spinal cord injury using hUCMSC transplantation collected by computer tomography (CT)-guided lumbar puncture under CT guidance, and compared the therapeutic effects with that in patients who only received functional rehabilitation exercises. Results showed that hUCMSC transplantation exhibited better therapeutic effects on neurological functions than functional rehabilitation exercises did. In 2013, they also performed a study involving 32 patients with diabetic peripheral neuropathy and treated them with a single intravenous infusion of hUCMSCs and a singly unilateral pancreatic vascular infusion of hUCMSCs. At 1, 3, and 6 months after cell infusion, patient's blood glucose levels decreased, and clinical symptoms and electrophysiological functions of the median nerve, ulnar nerve, posterior tibial nerve, and common peroneal nerve were greatly improved; further, no obvious adverse events were observed. Additionally, in 2013, in a randomized controlled clinical study, the study team treated patients with sequela of traumatic brain injury with stem cell transplantation by lumbar puncture, showing that hUCMSC transplantation significantly improved multiple neurological functions of patients with sequela of traumatic brain injury. In 2012, the team found that hUCMSCs transplantation by lumbar puncture could greatly improve motor function in patients with amyotrophic lateral sclerosis, although the therapeutic effects were not long-lasting and symptoms only improved in 25% of discharged patients. Beck AT, Steer RA (1984) Internal consistencies of the original and revised Beck Depression Inventory. J Clin Psychol 40:1365-1367. Cano SJ, Hobart JC, Hart PE, Korlipara LV, Schapira AH, Cooper JM (2005) International Cooperative Ataxia Rating Scale (ICARS): appropriate for studies of Friedreich's ataxia? Mov Disord 20:1585-1591. Chang YK, Chen MH, Chiang YH, Chen YF, Ma WH, Tseng CY, Soong BW, Ho JH, Lee OK (2011) Mesenchymal stem cell transplantation ameliorates motor function deterioration of spinocerebellar ataxia by rescuing cerebellar Purkinje cells. J Biomed Sci 18:54. 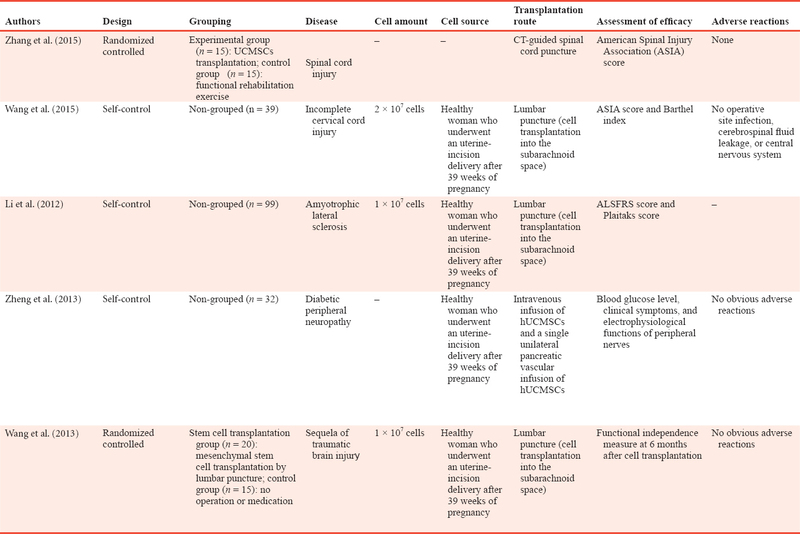 Cho PS, Messina DJ, Hirsh EL, Chi N, Goldman SN, Lo DP, Harris IR, Popma SH, Sachs DH, Huang CA (2008) Immunogenicity of umbilical cord tissue derived cells. Blood 111:430-438. Dalous J, Larghero J, Baud O (2012) Transplantation of umbilical cord-derived mesenchymal stem cells as a novel strategy to protect the central nervous system: technical aspects, preclinical studies, and clinical perspectives. Pediatr Res 71:482-490. Dong YS, Yin ZM, Wen H, Zhao DD, Wang L, Liu JC, Wang YC, Zhang JY, Chen S (2012) Curative effects and safety analysis of umbilical cord mesenchymal stem cell transplantation for treatment of cerebllar ataxia. Yixue Xinxi 25:169-170. Dongmei H, Jing L, Mei X, Ling Z, Hongmin Y, Zhidong W, Li D, Zikuan G, Hengxiang W (2011) Clinical analysis of the treatment of spinocerebellar ataxia and multiple system atrophy-cerebellar type with umbilical cord mesenchymal stromal cells. Cytotherapy 13:913-917. Duane DD, Vermilion KJ (2002) Cognitive deficits in patients with essential tremor. Neurology 58:1706. Fan CG, Zhang QJ, Zhou JR (2011) Therapeutic potentials of mesenchymal stem cells derived from human umbilical cord. Stem Cell Rev 7:195-207. Glavaski-Joksimovic A, Bohn MC (2013) Mesenchymal stem cells and neuroregeneration in Parkinson's disease. Exp Neurol 247:25-38. Hill KD, Schwarz JA, Kalogeropoulos AJ, Gibson SJ (1996) Fear of falling revisited. Arch Phys Med Rehabil 77:1025-1029. Jin JL, Liu Z, Lu ZJ, Guan DN, Wang C, Chen ZB, Zhang J, Zhang WY, Wu JY, Xu Y (2013) Safety and efficacy of umbilical cord mesenchymal stem cell therapy in hereditary spinocerebellar ataxia. Curr Neurovasc Res 10:11-20. Klee SH, Garfinkel BD (1983) The computerized continuous performance task: a new measure of inattention. J Abnorm Child Psychol 11:487-495. Li M, Hua RR, Yu AX, Zhang FF, Dai GH, Wang XD, Cheng HB, An YH (2012) Analysis of curative effects of umbilical cord mesenchymal stem cell transplantation in treatment of amyotrophic lateral sclerosis. Zhongguo Yiyao Daobao 9:52-54. Lim JY, Jeong CH, Jun JA, Kim SM, Ryu CH, Hou Y, Oh W, Chang JW, Jeun SS (2011) Therapeutic effects of human umbilical cord blood-derived mesenchymal stem cells after intrathecal administration by lumbar puncture in a rat model of cerebral ischemia. Stem Cell Res Ther 2:38. Lin YC, Ko TL, Shih YH, Lin MY, Fu TW, Hsiao HS, Hsu JY, Fu YS (2011) Human umbilical mesenchymal stem cells promote recovery after ischemic stroke. Stroke 42:2045-2053. Liu J, Xue M, Zhu L, Ding L, Yan HM, Wang ZD, Han DM, Guo ZK, Wang HX (2010) Clinical analysis on the treatment of spinocerebeilar ataxia and multiple system atrophy-cerebellar type with umbilical cord mesenchymal stem cells. Zuzhi Gongcheng yu Chongjian Waike Zazhi 6:257-260. Liu J, Han DM, Ding L, Xue M, Yan HM, Wang ZD, Zhu L, Zheng XL, Dong L, Guo ZK, Wang HX (2014) Intrathecal injection of umbilical cord mesenchymal stem cells for spinocerebellar ataxia. Zhongguo Zuzhi Gongcheng Yanjiu 18:6666-6670. Liu SP, Ding DC, Wang HJ, Su CY, Lin SZ, Li H, Shyu WC (2010) Nonsenescent Hsp27-upregulated MSCs implantation promotes neuroplasticity in stroke model. Cell Transplant 19:1261-1279. Qiu Y, Wang Z, Lu HS, Xu P, Chen WY, Lu YG, Ding YH (2012) Transplantation of umbilical cord mesenchymal stem cells for treatment of autosomal dominant spinocerebellar ataxias in 12 cases. Zhongguo Zuzhi Gongcheng Yanjiu 16:2652-2655. Shetty P, Cooper K, Viswanathan C (2010) Comparison of proliferative and multilineage differentiation potentials of cord matrix, cord blood, and bone marrow mesenchymal stem cells. Asian J Transfus Sci 4:14-24. Soleymaninejadian E, Pramanik K, Samadian E (2012) Immunomodulatory properties of mesenchymal stem cells: cytokines and factors. Am J Reprod Immunol 67:1-8. Spencer RM, Zelaznik HN, Diedrichsen J, Ivry RB (2003) Disrupted timing of discontinuous but not continuous movements by cerebellar lesions. Science 300:1437-1439. Steffen TM, Hacker TA, Mollinger L (2002) Age- and gender-related test performance in community-dwelling elderly people: Six-Minute Walk Test, Berg Balance Scale, Timed Up & Go Test, and gait speeds. Phys Ther 82:128-137. Taghizadeh RR, Cetrulo KJ, Cetrulo CL (2011) Wharton's Jelly stem cells: future clinical applications. Placenta 32 Suppl 4:S311-315. Tombaugh TN, McIntyre NJ (1992) The mini-mental state examination: a comprehensive review. J Am Geriatr Soc 40:922-935. Troyer DL, Weiss ML (2008) Concise review: Wharton's jelly -derived cells are a primitive stromal cell population. Stem Cells 26:591-599. Walter JT, Alviña K, Womack MD, Chevez C, Khodakhah K (2006) Decreases in the precision of Purkinje cell pacemaking cause cerebellar dysfunction and ataxia. Nat Neurosci 9:389-397. Wang HS, Hung SC, Peng ST, Huang CC, Wei HM, Guo YJ, Fu YS, Lai MC, Chen CC (2004) Mesenchymal stem cells in the Wharton's jelly of the human umbilical cord. Stem Cells 22:1330-1337. Wang PS, Liu XB, Yi L, Dai GH, Zhang Z, An YH (2015) Effect and safety of umbilical cord mesenchymal stem cell transplantation in treatment ofincomplete cervical spinal cord injury. Wujing Yixue 26:282-285. Wang S, Cheng HB, Wang XD, Dai GH, Hua RR, Liu XB, Yi L, Li LS, An YH (2013) Clinical efficacy of umbilical cord mesenchymal stem cell transplantation on 35 patients with traumatic brain injury sequelae. Haerbi Yike Daxue Xuebao 47:78-81. 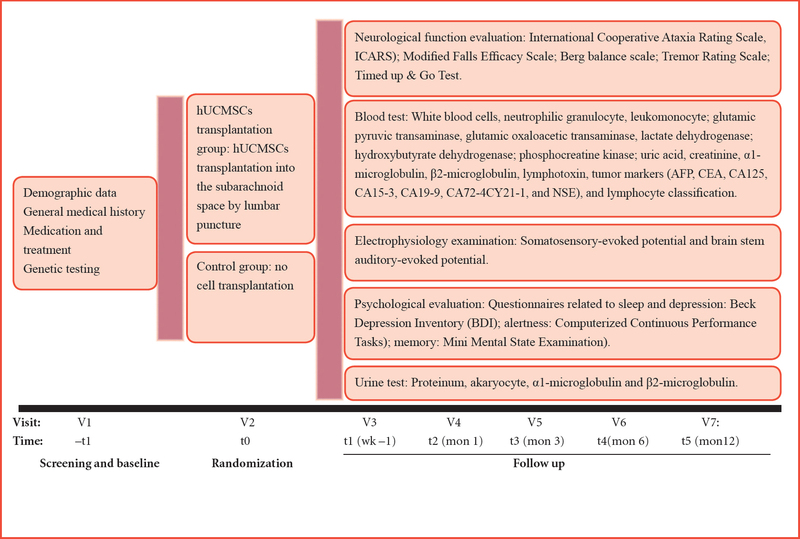 Weiss ML, Medicetty S, Bledsoe AR, Rachakatla RS, Choi M, Merchav S, Luo Y, Rao MS, Velagaleti G, Troyer D (2006) Human umbilical cord matrix stem cells: preliminary characterization and effect of transplantation in a rodent model of Parkinson's disease. Stem Cells 24:781-792. Xin JH, Chen W (2014) Short-term effects of combined ganglioside with umbilical cord blood stem cell transplantation for spinocerebellar ataxia.Wannan Yixueyuan Xuebao 33:305-307. Zhang MJ, Sun JJ, Qian L, Liu Z, Zhang Z, Cao W, Li W, Xu Y (2011) Human umbilical mesenchymal stem cells enhance the expression of neurotrophic factors and protect ataxic mice. Brain Res 1402:122-131. Zheng P, An YH, Wang XD, Hua RR, Zhu Y, Mu MY (2013) Therapeutic effect of human umbilical cord mesenchymal stem cell transplantation on diabetic peripheral neuropathy. Wujing Yixue 24:398-401.